It is hard to argue that winter is a marvelous and magical season. Being a closer and an opener at the same time, it is associated with summarizing, making resolutions and starting from scratch. Although we are accustomed to spending our time indoors while Jack Frost rages and nature falls asleep; however, it does not mean that creative folks sink into apathy. On the contrary, with Christmas on the horizon and spectacular and inspiring scenes all over the place, it is quite difficult to sit and do nothing. Winter inspires; that’s for sure. 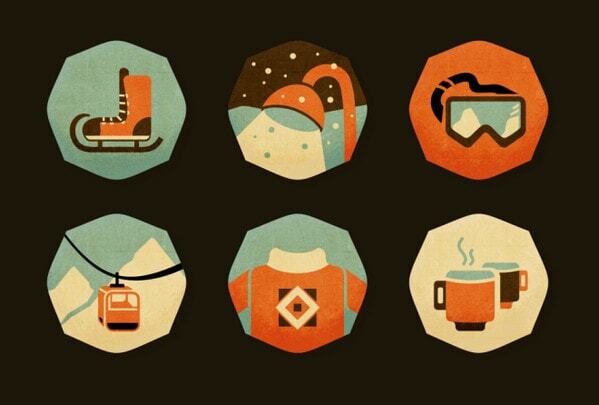 Today we are going to look at winter icon packs that were created for portraying the coldest time of the year. There is plenty of stuff that should be taken into account. For example, warm clothes (sweaters, mittens, or felt boots), sports activities (skis, snowboard), holidays (Santa Claus or festive decorations) and weather identifiers (ice, snowflakes), common ornamental objects such as snow globes and others. We have collected 20 examples of icon sets, including freebies, to get you in the wonderful winter spirit. 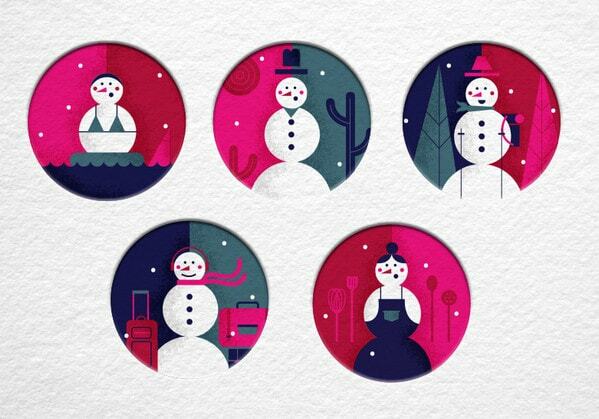 Winter Icon Set by Tamara has a subtle human touch realized on the basis of hand-drawn style. Each item oozes charisma and personality as well as has a vague sense of dynamics. The free package counts more than 30 items available in PSD and AI formats. Winter is Coming by Two Arms Inc.
Winter is Coming by Two Arms Inc. is a set of cool items that are filled with lots of details. While flat style keeps each little illustration from looking overwhelming, beautiful coloring softens the appearance. Winter by Szende Brassai is unique and visually appealing. Soft pastel coloring and subtle grunge touches give the package a fantastic retro feel. There are six carefully crafted items dedicated to popular winter activities. 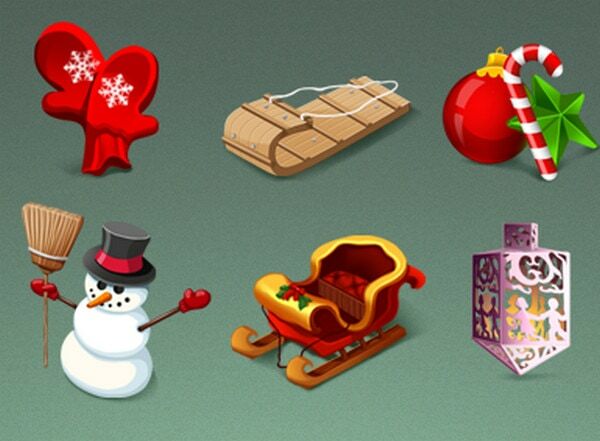 Christmas Icon set by Dasha gives off refinement and sophistication. The artist achieves the greatest output of line style as well as skillfully utilizes a two-tone coloring. The pack comprises several items in AI format that you can freely use for different purposes. Winter Icon Set by Neil Renicker is marked by a good use of three-tone coloring that provides each glyph with a pleasant, neat and elegant aesthetics. The designer opts for green and white, colors that are widely associated with the cold season, and black for clearly outlining shapes. Kasper Johnsen spruces up a standard icon with some winter-esque motifs. This small illustration charms with a cold appearance obtained through professionally crafted glossy and glassy surfaces, glacial vibe and realistic scratches. Although the freebie is quite old, it is still a great enhancement for any website UI. These shiny and circular objects with frosty appeal will add a note of snowy season to your project. The collection includes more than 70 items. Sant Valentin has chosen elements that symbolize both winter and its holidays. Each icon is a small illustration made with love. They look realistic and magical. There are a snow globe, Christmas tree, Santa Clause, a loyal elf and some others. Although the set does not feature skillful visualization of essential items of the cold season, as we have seen before. Nevertheless, it deserves its place in our list since it is made with winter in mind. The author leverages cold color scheme and lots of white to reproduce each item. As a result, UI looks crisp and even a bit frosty. This is an interesting variation on a popular attribute of interior decoration – a snow globe. There are five brilliant flat illustrations that show the main character in different environments and situations. Happy New Year Line Art Icons by Anna Sereda have a delicate and sleek appearance that is able to enhance UI or poster design with an exquisite feel. The set portrays elements that are typical of Christmas and New Year celebrations. Holiday Stuff by Oksana Mykytiuk is a special treat that gently reminds us of an era of skeuomorphism, when everything was bright, glossy, intense and sophisticated. 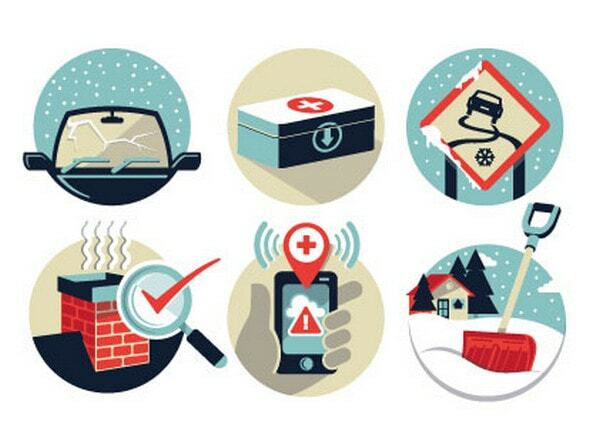 There are six brilliant icons that visualize mittens, Christmas tree decorations and more. Emilio Rios is managed to turn minimalism to its advantage by using gentle line style, solid color canvases and subtle shadow. Although at first it seems a bit primitive, yet it is a clever interpretation. Each item is intuitive and original. We could not help but include a free package of skillfully illustrated beloved ice crystals with a sixfold symmetry. 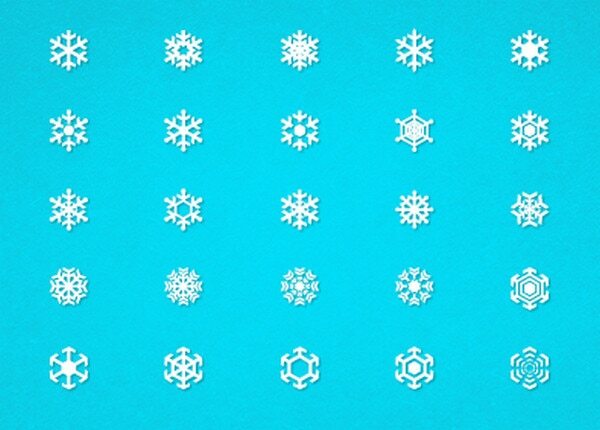 There are 25 different snowflakes that are presented in EPS format. Download and use it in your print designs or UIs. Winter time icon set by Inna Moreva features a gorgeous soft pastel coloring that puts a tasty twist on graphics. The set looks harmonious and sophisticated; 12 items characterize winter from different angles, covering activities, weather and clothes. This is a splendid line art that looks fresh and festive. It has a nice geometric vibe, soft edges, and stylish feel. Items work well together so that you can use them for creating seamless backgrounds or centerpieces. Download this freebie and make the most out of it. The icon set is a minimalistic not only in terms of assortment but also regarding design. Nevertheless, each glyph looks nice, tidy as well as conveys the meaning. The artist portrays sports including skis, snowboard and others. Winter Icons by Stacia Burtis are defined by the beautiful blue tone that breathes with frost and cold. The package comprises a collection of winter-related stuff that embraces various categories. Dropicons Update by Darius Dan breaks away from clean line style options and envelops with its bright nature and positive atmosphere. These festive icons easily showcase an attitude and spirit of the season. Vivid flat style as well as glossy and realistic skeuomorph-inspired solutions let portray objects more correctly as well as effectively convey cheerful atmosphere. However, as practice shows, fine line styles go perfectly well with the cold and icy season. Not only does it look stylish and modern, but it also reflects the delicate nature and stately beauty of the winter. Use characteristic details and corresponding coloring in order to achieve the desired result.